The crab ravioli with samphire was also excellent. The plump ravioli made with a fine pasta case and filled with sweet crab was submerged in a fondue of leeks and bisque sauce with brown shrimps. The result was a satisfying concoction of creamy, rustic flavours. 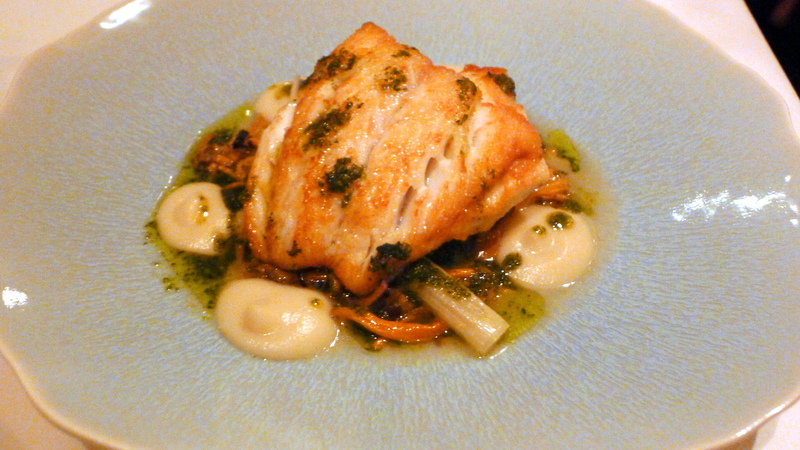 A beautifully cooked piece of moist roast cod came with a creamy Jerusalem artichoke purée, swiss chard that held onto its bite, and a fragrant salmoriglio. The design of the dish was highly accomplished, but the seasoning disappointed with its saltiness. Alongside the cod was a tasty, wholesome serving of boulangère potatoes that was quite salty as well. A grilled halibut was also beautifully cooked and sat alongside a potato galette that showed great skill in its preparation. 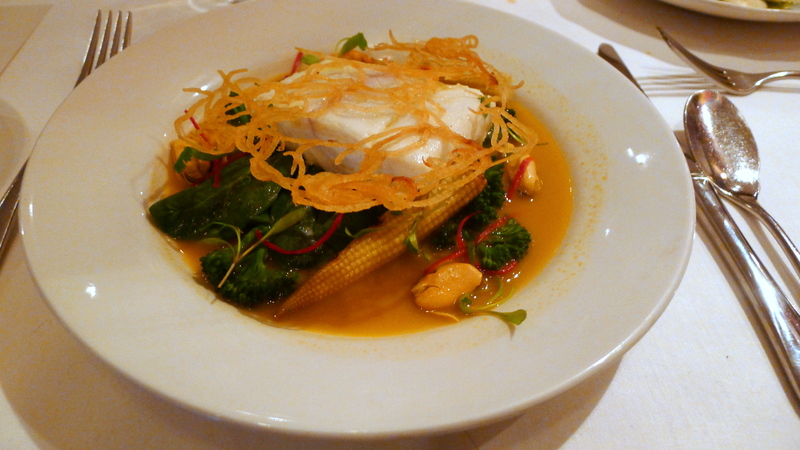 We liked the idea of a spiced mussel and saffron broth with tender stem broccoli and coriander to accompany the halibut, but here too, the seasoning of the broth was quite heavy. 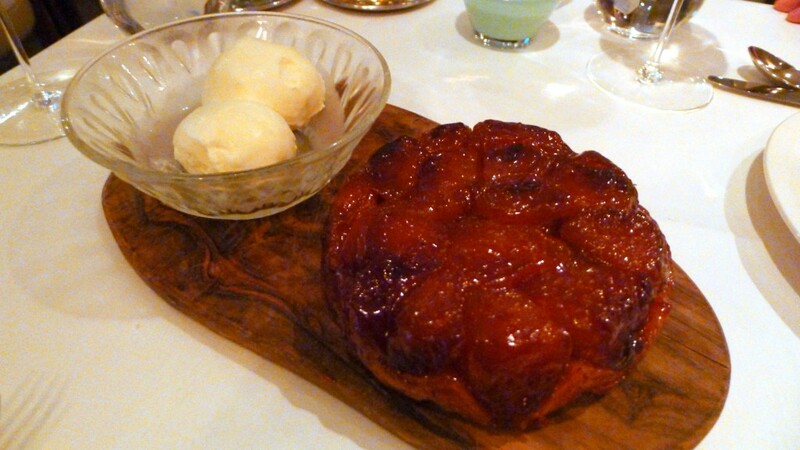 Tarte tatin with crème fraîche ice cream (for two) was resoundingly solid. The apples were soft and well cooked, if a touch sweet, and the pastry was light and flakey it a little lacking in buttery goodness. The subtlety of the crème fraîche ice cream was a pleasant match for the tart. 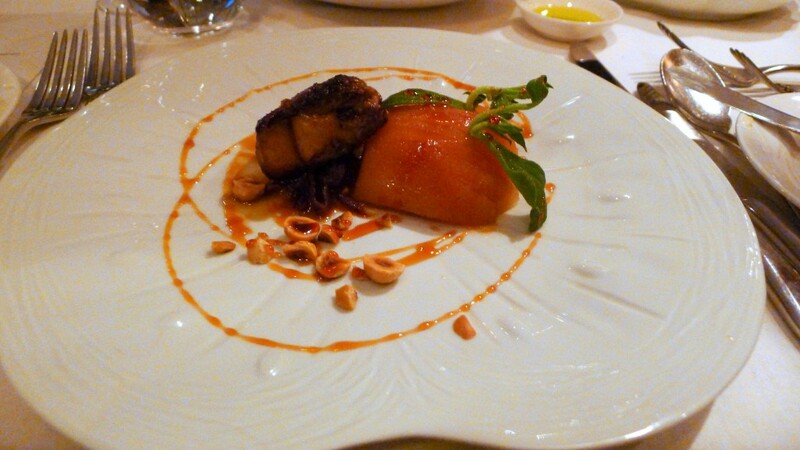 Medlar had been on my go to list for sometime and I went with expectations that were sky high, especially as most of the press reviews of Medlar have had nothing but praise that bordered on near perfection. But it wasn’t quite as perfect as those reviews suggested, and if perfection is what you are seeking then it’s probably best to temper your expectations a little. But credit where credit is due for it’s easy to understand why Medlar is such a hit. The two starters we tried were superb, and on the whole the cooking was as solid as a brick even if the seasoning was slightly off in parts. Medlar is a great ‘neighbourhood’ restaurant that offers comforting, rustic, heartfelt food, and the reasonable prices for this standard of cooking means it rates well on a value for money ratio, especially for a weekday lunch when the same meal is priced at only £27. We found the service to be pleasant and polished.